Is Atlanta’s Joe Johnson a Superstar? 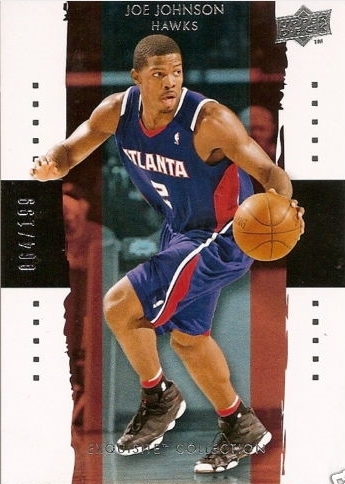 Although Joe Johnson of the Atlanta Hawks is regarded as one of the NBA’s most feared shooters (and one of best all-around talents by opposing players and coaching staffs alike), he has never been considered a superstar by the fans. But if he helps lead the Hawks back to the playoffs and improves on his All-Star caliber numbers, Johnson stands poised to make superstar dollars as a free agent during the 2010 off-season. While upwards of 8-10 teams are slashing payroll in hopes of landing one of the prized free agents like Lebron, Wade, or Bosh, Joe Johnson could be a viable fallback solution for those teams who lose out on one of “The Big 3″, and are looking for their next franchise player. Even though on the surface it is sometimes hard to understand how or why a player would turn down another multi-million dollar deal, sometimes the move could turn out to be a good one, as in Johnson’s scenario. Turning down and extension worth four years at $60 million is actually a good move considering he should command a deal around five years at $100 million. Which begs the question: Is Joe Johnson worthy of a max free agent deal? Let’s look at the numbers. At 6’7, 240 pounds, and 28 years old, he is entering his prime years and is the perfect size for a two guard or even the small forward position at times (on a team with a small lineup). Although he started off slowly by never averaging more than 9.8 ppg in his first two seasons, Joe upped his game while in Phoenix, averaging 17 ppg, and became an All-Star caliber talent since the trade to Atlanta in ’05 by averaging 20+ ppg every season for the Hawks. He had a career year in ’06-’07 when he was among the top scorers in the league, going at a 25 ppg clip. His last two seasons have been identical with Johnson showing his all around game by posting 21 ppg, 6 assists, and 4 rebounds. He has also been very reliable, playing in 77 or more games in seven of his eight seasons. Add being a principal participant for USA Basketball in the ’06 World Championships and captaining an Atlanta Hawks squad into the playoffs the past two seasons, and Johnson possesses a basketball resume that many players would dream of. So I’ll ask again: is he worthy of a max free agent deal next Summer? Probably not, but considering his age, durability, and phenomenal skill set, some team will shove a boatload of dough in Johnson’s direction if they lose out on LeBron, Wade, or Bosh. In my opinion, he would be a great second banana, in the Scottie Pippen-to-Michael Jordan mold. It’s not impossible for Johnson to be in that very scenario next summer, since a few teams like the Knicks and Nets have enough cash freed up to sign 2 players to max deals. Imagine LeBron and Johnson both playing at MSG for the Knickerbockers thru 2015! The future looks bright for Johnson since most GM’s have him in ranked within their second tier of free agents next year, along with Amare Stoudemire, Dirk Nowitzki, Yao Ming, and possibly Carmelo Anthony, who will all have the Brinks truck backing up to their front door with bags of money. Ultimately Johnson holds all of the cards concerning his future. He can chose to shoulder the burden of being the new face of a franchise, or take the role of a supporting sidekick to a 30 ppg scorer in an attempt to win a championship.